Long before Richard Bode’s bestseller on life’s little lessons, the boatmen of Kabini had learnt the selfsame ‘art of living’ in their little floating classroom: the Coracle! 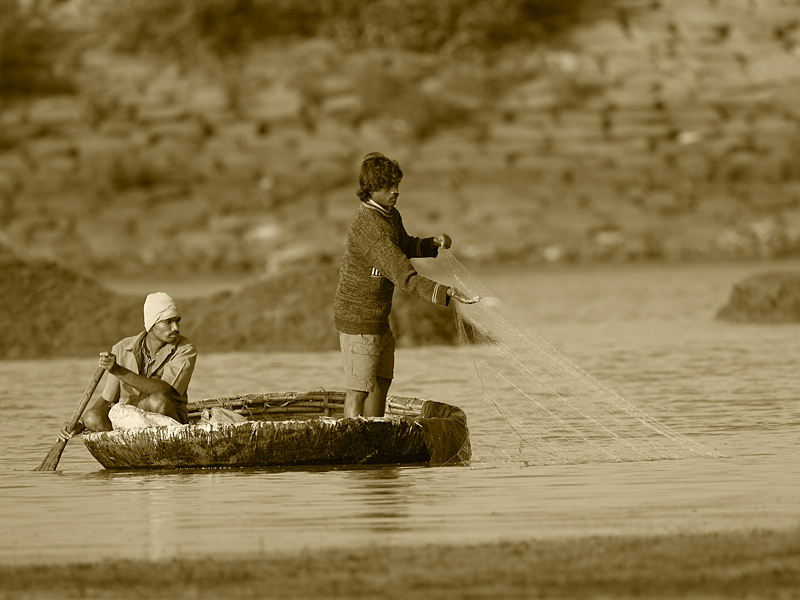 Living, as they did, on the banks of the Kabini, the Coracle was their friend, philosopher and guide: a constant companion as they went about the business of life. Originally made with a split bamboo frame held fast by animal skins and waterproofed by the application of resin and coconut oil, this country craft is highly manoeuvrable, and glides effortlessly without disturbing the water. This comes in handy when you’re a solitary fisherman who has to navigate with one hand whilst casting the net with the other. In fact, this ease of usage by a single person is what makes it so unique. If you were familiar with the lore of the British Isles, you’d probably go “Llwyth dyn ei gorwgl”. For those who think this is a British throat-clearing callisthenic, we’d like to tell you that it is a Welsh saying for “the load of a man is his coracle”, referring to how a single man could carry the Coracle on his back to navigate life. In fact, its etymology owes to the Welsh Cwrwgl (refined by the consonant-challenged Brits) that has been in use for millennia in navigating the afons and nants of Wales. Back in Kabini, this is the ‘Swiss Knife’ of boats, and the multitudinous uses it’s put to include fishing, ferrying passengers, parcels and mobikes, and acting as an impromptu rain shelter on land, when inverted and supported by a stick. Entire generations in Kabini have grown up secure in the belief, that to take on life’s choppy waters, all they have to do is…row, row, row a little boat! This entry was posted on Wednesday, May 2nd, 2012 at 6:17 am and is filed under Culture . You can follow any responses to this entry through the RSS 2.0 feed. You can leave a response, or trackback from your own site. That’s beautiful! Way to go! Thanks for sharing this wonderful information….I wish i could row one of these on my next visit there….. Still always wait to see the colourful “BIRDS” pictures. Lovely! And a refreshing change! Typical Kabini, rural scene. However, the image needs a little CW rotation.